Two-person course project with Manfred Micaux. Then got help from Michel Beaudouin-Lafon and David Bonnet to write the CHI paper. ■ Research: User Study, Paper Prototyping, Research Paper and Poster Presentation. Problem: Tablets are great for browsing content but they're much less efficient for creating it. For example, copy & paste using long presses and contextual menus is slow and error-prone. As a result, tablet users spend only 15% of their time on production activities. Solution: SPad is a bimanual interaction technique designed to improve tablet productivity: the user controls a menu with the thumb of the hand that holds the device, and interacts with the content with the other hand. The iPad implementation of SPad in a sample graphical editing application demonstrates how SPad enables faster, more direct, and more powerful interaction. Take a look at the paper below for a detailed presentation. Cédric Foucault, Manfred Micaux, David Bonnet and Michel Beaudouin-Lafon (2014). "SPad: A Bimanual Interaction Technique for Productivity Applications on Multi-touch Tablets". In CHI '14 Extended Abstracts on Human Factors in Computing Systems (pp. 1879-1884). ACM. Poster presented during the conference. 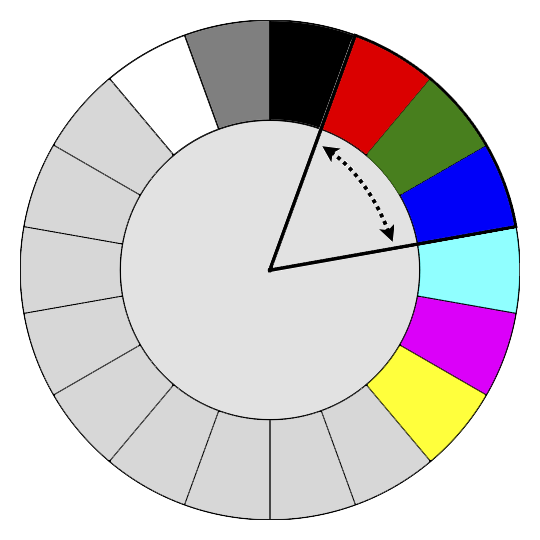 The early prototype used a wheel metaphor, and users had to scroll to change button arches. Exploratory user study with a paper prototype, showing notably that the scrolling solution was inferior to the direct mapping we used in the final prototype.